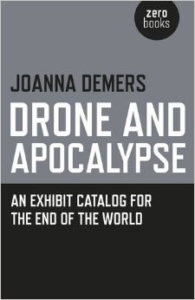 Joanna Demers is an academic but Drone and Apocalypse is not quite your typical academic book. Though Demers frames the work as a furthering of her professional interest in experimental electronic music, it’s also clearly a personal record of listening to and being moved by that same music. The book is mostly made up of a series of short essays about particular musicians — William Basinski, Thomas Koner, Eliane Radigue and, most of all, Celer — operating in the ambient/drone area of electronic music, analyzed with the help of ancient Greek texts and examples of classic literature. The essays are essentially non-fictional but they come presented within a fictional context: an exhibition in the year 2213 featuring the writing and speculative artworks of an early 21st century artist-of-sorts, Cynthia Wey. Wey’s ‘speculative artworks’ are propositions for work never realized — photo collages, video installations, etc — that extend or express the ideas contained within the essays. The book opens with Demers’ preface, which explains her reasoning behind this structure and her interest in drone music, which is followed by an introductory essay by the curators of the exhibition, doubling up on Demers’ notes as a fictionalized, art-world version of the same set of justifications and explanations. Together they set out the questions at the heart of the book: What are the philosophical foundations of drone music? What do we mean when we say ‘the end of the world’? How do we speak about something that has no meaning? Cynthia Way is the figure Demers uses to think her way through these questions. Wey’s biography marks her as someone both inside and outside the traditional academy. As an MFA graduate working as an administrative assistant in the music department at UC San Diego, where “her job consisted of preparing payroll for faculty, staff and graduate students,” Wey has contact with and knowledge of the university structure. The work presented here — impassioned personal essays written at home, mostly at night — eludes these structures entirely. Wey is able to access the traditions, knowledge, and practices of the university without having to write into those same traditions, without being bound by their limited affordances. Through Wey, Demers gives herself the space to advance an academic pursuit in a more personal, more ambiguous way. The music Demers is writing about is, in her own words, “slippery, resistant to deciphering, and perhaps eternally unknowable,” but the somewhat loose nature of a private journal allows her to attach words to these ineffable sounds, without having to make those words stick fast. She can decorate, she can cut quickly between ideas and references, she can advance and retreat. In this form, the blissful ignorance of wallowing in the meaninglessness of sustained tones needn’t be sacrificed for the sake of concrete knowledge. Wey’s character allows the writing to retain the kind of negative capability that a more straightforward academic structure would likely disallow. Like with the music itself, which eschews narrative and conclusion, it’s being there that counts. Drone music is a niche subject. Those who dismiss it likely find it boring or uselessly pretty, and much of it is indeed just a beautiful, glistening waste of time. Wey’s essays hit on the substance of the form though, which is its relationship to time and how, at their strongest, such sounds can open a space where both the crushing melancholia of memory and the anxious projections of hope for the future can be indulged. Extended, repetitious, near-unchanging drone pieces seem to freeze the listener in time, to slow the world around them and allow a certain kind of internal observation to take place, an existential or meditative self-examination. Wey repeatedly comes back to one such dilemma: What does it mean to feel moments of happiness, joy even, in the face of a sure and imminent apocalypse? She contrasts Celer’s music and Aristotle’s Nicomachean Ethics in search of an answer. In the latter, happiness is something to push towards over an entire lifetime, an endeavor which can only be judged successful at the end of that life. In Celer’s music, and Dostoevsky’s The Idiot, Wey pin-points a different type of happiness in which a lifetime’s worth of the emotion can be felt within a single moment, even if such a moment comes at a great cost — not least the knowledge, after the moment has passed, of the continual absence of such great joy, such peace. In Celer’s Salvaged Violets, Wey imagines such a moment frozen and distended, looping forever as “an edifice of eternal happiness, eternal for however long it lasts,” implying always an afterward, a hollow encore. However long it lasts is another of Wey’s pressing concerns. She is a character who foresees an imminent end to human life on earth. One of the aspects of drone music which she finds most attractive is its ability to look at the end of the world without dramatizing it, without making the apocalyptic event a transcendent event. Drone is often an “anatomical art,” cataloging its ideas and sounds rather than expressing them through narrative or sullying them with a message or an imperative. This form of documentation — the manifest, the list — which is as evident in Wey’s own essays as in the music she writes about, is for her the only understandable reaction to the “bleakest knowledge” that all will pass, and pass soon. Such artworks are the “only fitting response after the heart has burned and bled and then stopped.” In listing what exists despite their assured destruction, they “prove that we were ever here.” That they cannot list everything and must remain incomplete is the source of their melancholy. Wey, and Demers too, must always return to this incomprehensible center, the void at the heart of the music and of the book. If the essays and artworks in the book are speculative, then so is the book itself. Drone and Apocalpyse speculates on what form knowledge might take in the face of the unknowable. What does knowledge look and feel like when it is uncertain, or beyond proof? The obvious answer is that it looks like faith, and the book is in part a delineation of a secular, nihilistic faith, a faith that can rely only on worldly beauty for its unifying force. Wey’s belief in beauty, her faith in the music which gives her a center with which to face an inevitable void, is matched by Demers belief in her structure; that this literary form might be a way of following and accompanying the meaningless and the inexpressible. Not unpacking or deconstructing it, not building it up to an ideology of its own, but simply being with it until a certain point, beyond which there is no being at all.